It's Freebie Time! April Showers bring May Flowers! Time is sure flying by! I am happy to release May's Freebie digital stamp today which is called May Flower! 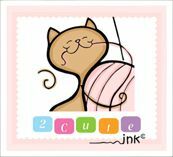 Just make sure you are signed up for the 2 cute ink newsletter it is that easy! I had fun coloring this flower and I hope you will too! :) Don't forget there is a special challenge in the 2 Cute Ink digital stamps Facebook group just for this May Flower Freebie!